Update: Top Notch has closed and been replaces by the Pitchwood Alehouse. 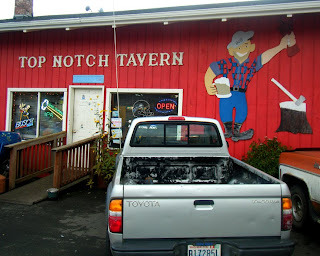 The Top Notch is just the sort of bar you'd like to find on a gusty Willapa Bay weekday afternoon. The parking lot is all trucks, the interior is woodsy with taxidermy mounts and signed dollar bills tacked to the walls, and strung around the corner of the bar was a grizzled set of regulars that looked like they just rolled off of an episode of "Deadliest Catch." As soon as I entered, a fellow shook my hand and told that he'd been wondering when I'd show up again. When I told him I'd never been in this place before in my life, he informed me that there was going to be a fight, and I was going to be on his side. A fight did not seem imminent given how comfortably ensconced in their bar stools everyone appeared -- though I've little doubt that the place has seen its share of scraps in its day. I later told Tom, the fellow that greeted me, that I was heading out to Long Beach peninsula, he told me that he used to have some kind of realtor or inspector job in that area and knew "every spot to piss in" up in those parts. 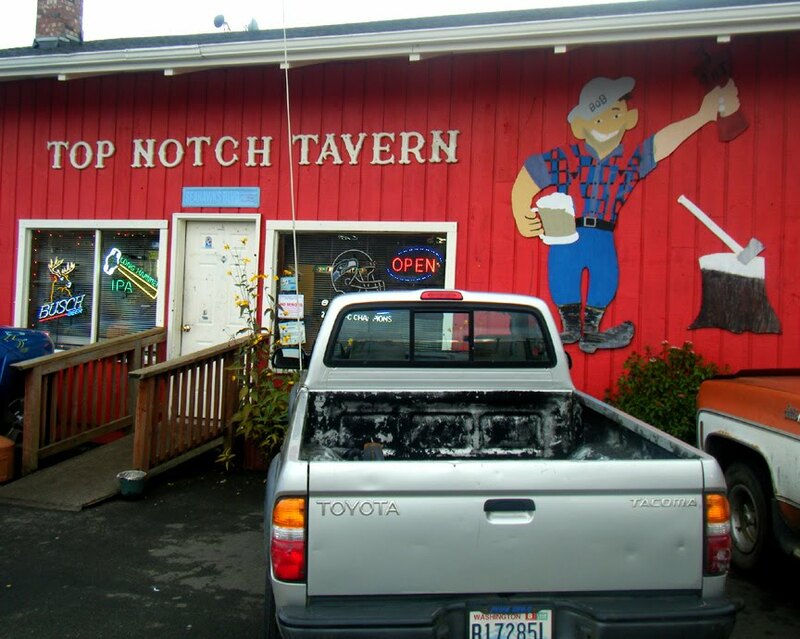 "Top Notch Tavern - Bartender - I quit this job because money kept missing from my check." "The Top Notch Tavern in Raymond was originally opened by my great-uncle, who had been a moonshiner and bootlegger supreme in earlier years. I believe he died in his 50s of a heart attack during his trial for murder when he beat a business associate to death with a chair in Aberdeen. Alcohol was involved, I'm sure. That is one of the milder stories about my family in Raymond." Historical notes: I know the town of Raymond as a sleepy, small community of antique shops and roadside metal sculpture, bisected by Highway 101 on the way to Long Beach. I believe that the Top Notch is the only bar in Raymond, today, along with Tombstone Wiley's on the outskirts of town. But a century ago Raymond was rollicking. Bars preceding prohibition in town included Kuehner’s Tavern, The Russell Bar, The Astoria Bar, Owl Bar, The Palm Bar, Portland Beer Hall, Office Bar, The Doctor Bar, and the Combination Bar. Local Doug Allen quotes the Pacific County sheriff describing Raymond's 1st Street as a "howling wilderness." A series of anti-beer and liquor laws, dating from 1913, and lasting until 1933, began to affect the saloon owners and shopkeepers, especially the European-born. The prohibition era, combined with the movement of Raymond’s commercial district toward Third Street and beyond, led to significant changes in the 1930s and 1940s, which is more recognizable in the memories of today’s group of senior citizens. The days of Prohibition in Raymond, South Bend, and the Willapa Valley is a story unto itself but Raymond’s saloons managed to stay in business as pool halls and “social clubs.” Bootleggers and police were kept busy. At least one dairy farmer supplemented his income by delivering milk bottles painted white, filled with the product of a secret still. Searching back before the ‘forties, to the period of time between 1903 and 1930, the amateur sleuth can discover a street that had been the city’s focal place of business and social life. Even in the years immediately following World War II, through the 1950s, First Street clung to its former character, its businesses and social gatherings still reflecting a vibrant role in the life of the city.